A heat map from the Travis County Appraisal District showing changes in property values in the Austin area. TCAD said while values are increasing, they aren't increasing as dramatically as they have in previous years. TCAD image. 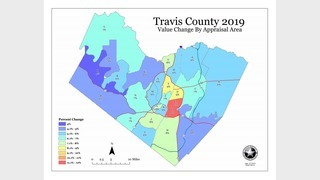 AUSTIN (KXAN) —The Travis County Appraisal District has finalized their assessments of 2019 property values. The numbers, they say, show a "slight softening" of the Austin market, as values are not increasing quite as dramatically as they have in years past. Values in the area are still on the rise. This is the Austin region's 10th year of positive trends — both in real estate and in the economy overall. The total new value in Travis County this year is about $5 billion, the appraisal district reported. TCAD says the average appraised value increase this year in Travis County is 7.4 percent. The large volume of new homes on the market lowers the sale prices seen for Travis County homes, TCAD said. Most of the value change in Travis County was less than 10 percent, with the exception of the areas directly east of downtown which saw a 12 percent increase in value. TCAD said this is because East Austin is a "hot market", but they noted even the increase in values in East Austin isn't as high as it was in years past. Marya Crigler, Chief Appraiser for TCAD, explained that at other points in the past five years, East Austin values have appreciated as much as 26 percent. She explained that East Austin has seen greater interest and appreciation in values ever since "the end of the Great Recession." "That is a hot market with all of the development that is going on along the east side, along Riverside," Crigler said. "That's made it a much more attractive market, so we're seeing a lot of people moving in, buying, a lot of redevelopment, a lot of new commercial [development] going in, a lot of new multi-family going in — and again that is all attracting new buyers into that market and the homes are selling for a lot more." But overall, the appreciation in values across the county isn't quite as dramatic as it has been over the past few years. "So for residential properties, while in the past we've had double-digit appreciation across the entire county, now we're seeing that that double-digit appreciation is pretty much limited to East Austin, and even there it is only between 10 and 12 percent appreciation," Crigler said. "The remainder of the county we're seeing appreciation [around] 7 percent. That's a lot different than three years ago when we were seeing widespread appreciation in 18-20 percent range." Crigler believes this "softening" of the market has been caused by an increase in interest rates, which she says will often dampen the rate of people buying homes. She explained that Travis County has seen more new homes being developed in 2019, but not enough to overcome the imbalance of greater demand than supply for housing in Austin. She added that all those new homes on the market can cause sale prices to dip for the other homes in the area as well. "We are seeing a softening of the Austin market, again the values are still going up, sales prices are still going up, but it is nowhere near the rate we saw in the last three to four years," Crigler said. TCAD says that the rental market in Austin is also doing well and that it is uncommon to see a vacancy rate higher than 5 percent. How do appraisals impact property taxes? TCAD will be mailing out 438,000 appraisal notices this week. The 30 percent of property owners whose value increased by less than $1,000 will get a postcard from the appraisal district in lieu of a notice of appraisal value. To get those numbers, TCAD reviews sales in the area. The appraisal value is used by city, county, school district, and other local government entities to set 2019 property taxes. Crigler explained that a growing number of people come to TCAD to protest their appraisals each year. In fact, last year TCAD received more than 142,000 protests. They worked with a third-party group to study why they had such a high volume of protests and found that 75 percent of those people were protesting taxes rather than the actual appraised value of their property. "What the appraisal district can do is we can adjust their value, because that's what we have control over," Crigler said. "We cannot lower their taxes by the appraisal district. A lot of that is determined by the tax rates that get set — and that happens later on." The increase in values does not always mean an increase in taxes, Crigler noted. But she acknowledged that there is a public misperception: people protest the appraisal district when their taxes increase, thinking TCAD can offer the fix. "A lot of taxpayers think we are setting the tax rate, which we don't have any control over." She added that the budget and tax rate have a greater impact on your taxes than the appraisals . Crigler said after the appraisals are set, the next step is for local tax entities to set the tax rates. Those local entities set tax rates depending on their budgets and the services they need to offer people who live there. "So we are just the first step in the process, but we are by no means the end of the determinant of how much they are going to pay in taxes. That determination really happens after the tax rates are set." So how does Crigler suggest people make speak out when they are frustrated with their property taxes? She suggests that people show up to elections and budget hearings. Crigler said that despite the thousands who protest their appraisal value each year, only dozens of people actually attend city budget hearings. "It's easy to come to the appraisal district and file your protest because we send a notice of appraised value to every property owner, we schedule them for an indidvidual meeting, they can come into the appraisal district and meet one-on-one with a person. It's a lot harder to participate in the tax rate side." For most property owners, Crigler said, there are around five different local entities taxing them, and for each of those entities there are both budget meetings and tax rate meetings. "So that's 10 meetings you would have to attend. They don't send you notice personally of when those hearings occur," she explained. That disconnect for frustrated taxpayers is part of why Travis County created its TravisTaxes.com website last year. The 2018 data is available on the website and you can research by dates and properties to find which entities are taxing you and how each rate impacts the amount you're being asked to pay. The site also gives taxpayers information about the next hearings related to their tax rates so that they can be more involved in the conversation. The model for the Travis Tax website is what's being used in Texas Senate Bill 2 and House Bill 2 which are in the state legislature now, Crigler said. TCAD doesn't take a position on those bills, though Austin city leaders have not been shy about their disapproval of the proposed changes. Crigler said that if the property tax bills pass, it wouldn't bring on any significant changes for TCAD. Property owners can check their notice of appraised value on the Travis Central Appraisal District website and make sure they are getting credit for all of the exemptions they are entitled to. You can also find forms for Homestead exemptions on the website. Property owners who disagree with how their property's market value has been appraised can file a protest with the Appraisal Review Board, the deadline for filing a protest is May 15 or 30 days after TCAD mailed you a notice of the appraised value, whichever is later. AUSTIN (KXAN) -- In May, the Austin Transportation Department, Capital Metro and Austin's Corridor Program Office will team up to begin reworking the way buses get through one of the busiest corridors in downtown Austin. The far right Lane of Lavaca Street between 15th and 18th Streets will become a dedicated transit-only lane, in which buses will have their own left turn signal on to 18th from Lavaca. From there, they will be routed on to Guadalupe Street in a northbound bus lane that will go against southbound one-way traffic, until it hits Martin Luther King Jr. Boulevard. Buses will then move across MLK using another bus-only signal, to make it on to the next stretch of Guadalupe. AUSTIN (KXAN) — One of the three defendants in the brutal 2016 beating death of an elderly Del Valle man pleaded guilty and was sentenced to 25 years in prison. Clifton Wade negotiated a plea deal for his part in the death of 68-year-old Lee King in May 2016, according to the Travis County District Clerk's office. Wade's trial was supposed to Monday but due to the plea deal, he went straight to sentencing. On the night of King's death, police responded to Plains Crest Drive home after a home burglary panic button was pressed. Police found Wade, his face covered in blood, at the home. At the time, he told police that King had been beaten and identified the suspect as Reginald Wright. AUSTIN (KXAN) — More than a month after Murchison Middle School's principal abruptly resigned, citing "recent challenges" at the school, a new principal is officially stepping in. Beth Newton, who was named interim principal in the absence of Brad Clark, is now officially leading the school after the Austin School Board confirmed her. Newton had been principal of Hill Elementary school, which is now looking for a new leader. In the meantime, Jack Drummond is taking in the role through the end of the school year. What's the buzz on bees in Texas?